At Holistic Specialists we apply the latest in functional medicine, addressing the underlying causes of your gastrointestinal disorders (instead of just treating symptoms) so you can get well and stay well without unnecessary drugs or surgery. We use cutting-edge diagnostic tools to find the problem, and nutritional therapy, herbal medicine, supplements, stress management, detoxification, lifestyle changes, and—only in some cases when necessary—we recommend prescription medications to eliminate triggers and restore proper function and balance. Gut problems are epidemic in the modern world. 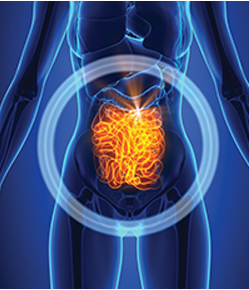 Irritable bowel syndrome, or IBS, affects up to 15 percent of the population. Sixty percent of U.S. adults experience the symptoms of GERD in a one year period, and up to 30 percent experience them weekly. But gut dysfunction doesn’t just affect the gut, it affects every other system of the body. We now know that an unhealthy gut may contribute to a wide range of diseases, including diabetes, obesity, rheumatoid arthritis, autism spectrum disorder, depression, and chronic fatigue syndrome. In a surprisingly high percentage of these cases, the patient may not have significant gut symptoms, so neither they nor their doctors ever suspect that gut dysfunction may be playing a role. At Holistic Specialists we are concerned with the underlying cause of disease, not just its symptoms and expression. And the crucial thing to understand is that gut dysfunction is an incredibly common underlying factor in most modern, chronic, inflammatory conditions.